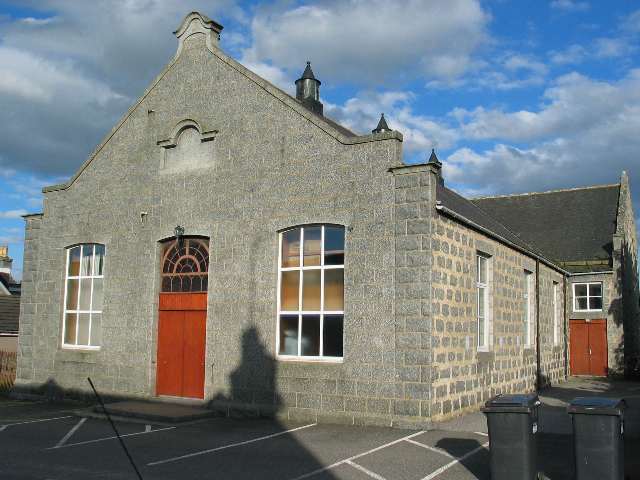 The Alford Public Hall was in the 1930s, 1940s and 1950s transformed on most Saturday nights into the Glen Cinema. The projection room was located in the loft area above the entrance door, on the reverse side of the building dedication stone, which declares that the hall was opened in 1901. A screen would be set up on the stage at the other end of the hall. To all intents and purposes, The Glen, as the public hall was known on once-a-week cinema nights, would have been indistinguishable from a full-time professional cinema apart from the fact that the seats were stackable chairs and the floor was stripwood on the flat throughout. The projectionist was Sandy Murray, an immensely kind man, who had a habit of playing back certain parts of the wartime newsreels at the end of the evening if any local families thought that, first time round, they had glimpsed a loved one serving in Europe or the Far East. Internally, it has been spruced up quite substantially, so that anyone from wartime would not recognise it as the same place. Originally seated 350. Pictures courtesy of Norman Harper.